I am still sick. It's no fun at all. I'm not allowed to drink any medicine as it might harm the baby. So all I am drinking is water (loads of it), fresh orange juice and lots of rest, rest rest. I recently discovered this dress in my old clothes pile that I stuffed in the attic. Decided to pair it with my oversize BF vest and floral fedora. I remembered that I have a pair of pink & black spectators and it's a perfect match with the dress don't you think? 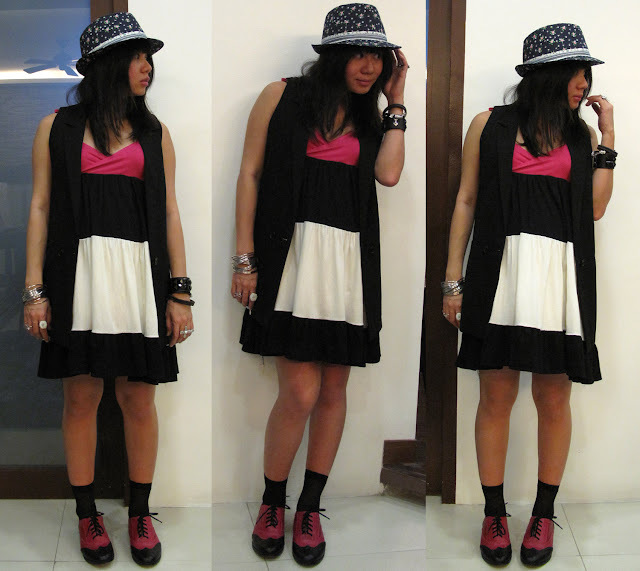 Toning down the girly-ness of the dress with "manly" pieces. love your collection of spectator shoes babe! and yes it´s a perfect match to this dress! also, i saw the one of your shoe collection, & man, i thought i already had a lot! so jealous right now. can i please have just one layer of one of your cabinets? are you a size 8? haha, just kidding! hey gorgeous! i super love the shoes ha. and it matches well with the dress. gandara lang! hey lloyda. i have een visiting your site for some time now and i enjoy all your ensembles. i particularly love this one because i love pink. hahaha! OMG! Those pink and black Oxfords are everything I have ever dreamed of! Oh, pretty, pretty pair! How I love thee!